When it comes to the process of ending your marriage, one of the biggest questions you need to answer is whether or not to hire a divorce lawyer. Thanks to various online tools and how-to guides, it’s now easier than ever to take a do-it-yourself approach. Sure, this strategy can save a significant amount of money in the short run. In simple cases, it may fit your needs perfectly. But while this option is now more accessible than ever, that doesn’t necessarily mean you should forego consulting a divorce lawyer. Should I hire a divorce lawyer? Answering the question, “Should I hire a divorce lawyer?” isn’t always easy. Every marriage is different and the ends are just as unique. Even cases that appear simple on the surface can get twisted in a hurry. It often serves your best interests to have competent, professional representation. Or at least talk to an attorney. Take a look at these questions below and answer them honestly. While this isn’t an exhaustive list and by no means covers every scenario, by the end, you’ll hopefully have a better idea of your needs. 1. Are You Ready to Divorce? Infidelity, abuse, financial betrayal, and more. Marriages end for many reasons, but not all of them are dramatic. Often relationships just don’t work out or people drift apart over time. You may roll your eyes and say, “Duh,” about this question, but you need to consider whether your marriage is truly over and if you’re ready to walk away. The answer to this question is different for everyone, and though it may sound obvious, it’s an important one to ask. Related Reading: What is Legal Separation and is it Right for You? 2. Does Your Spouse Have a Divorce Lawyer? If your spouse has a divorce lawyer, it’s in your best interests to hire one of your own. At least do the legwork and explore your options. We commonly compare representing yourself against an experienced attorney to a beer league softball player getting into the batter’s box against an MLB pitcher. Sure, they’re technically the same game, but not really. It often places you at a serious disadvantage. 3. Do You Have Property to Divide? A DIY strategy works best in cases where you don’t have much shared property to divide. The more there is to split up, the more potential for conflict you find. An experienced divorce lawyer has been through this many times and can help steer you through the process, letting you know what’s worth fighting for and what to let go. 4. Do You Have Kids? If you think property complicates things, that’s nothing compared to children. We love our kids and want what’s best for them, which is why custody battles often become so heated. You can work out a parenting plan, child support, and the rest on your own. But when children factor in, emotions flare. It’s important to keep a level head and make sure you remain an important part of your child’s life. Sometimes a third-party can help you accomplish this goal. 5. Do You Understand the Paperwork? You have numerous outlets where you can download forms, fill them out, and file them yourself. But do you truly know what you’re signing? Legal language and paperwork are notoriously complex and specific. If you make a mistake it can damage the outcome or even invalidate the entire process. In many cases, it’s worth the expense to have a divorce lawyer guide you through the intricacies of the process or at least examine the paperwork before you finalize things. Related Reading: Can Both Spouses Use the Same Divorce Lawyer? 6. Is Your Divorce High Conflict? Most people don’t end a marriage because everything is great. Divorce is an emotional and tumultuous experience full of bitterness, resentment, and conflict. People don’t always think straight or consider the consequences of their actions. A divorce lawyer can provide a steady hand and rational opinion in chaotic times and keep you from making rash decisions based on anger. 7. Can You And Your Ex Communicate? One common side effect of conflict in divorce is it often becomes difficult to communicate. If you can’t see each other or speak without fighting, how can you effectively negotiate the terms of your divorce? Again, experienced representation helps keep situations calm and serves as a buffer or go-between for spouses who don’t want to see each other. 8. Do You Know What You’re Entitled To? Do you know what you’re legally entitled to? Every situation is different, but you have rights to a portion of shared assets. When you have kids, you also have parental rights. If your spouse has a pension or other retirement account, guess what? You may have a legal claim to a share of that in the settlement. Divorce comes with a list of rules, regulations, and laws. Many of them are obvious and well known, but others aren’t. A divorce lawyer may clue you into things you didn’t know existed and keep you from leaving assets on the table. 9. Is That Divorce Settlement Fair? Divorce has a huge impact on your financial future. It’s important to handle your business so you don’t kick off this new phase of your life in the hole. You can’t just agree to a proposed settlement in order to be done with the process faster. What you need is to be certain a settlement is fair and gives you what you need. A divorce lawyer can tell you if an agreement includes what it should, is the best you’ll get, and whether or not it’s fair. 10. Is Your Divorce Complex? Do you own multiple homes, keep a fleet of expensive cars, or have multiple children of various ages? While it is possible for you and your ex to hammer out a divorce settlement, the more factors you have to consider, the trickier it becomes and the more potential pitfalls you face. It’s all too easy to make costly mistakes. Once the documents are signed, it’s difficult to change them, so it’s best to do it right the first time. 11. Do You Need a Divorce Lawyer? 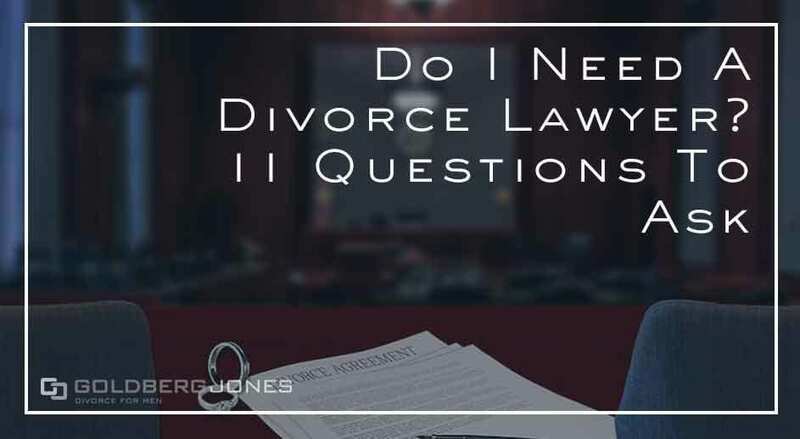 In short, how you answer the above questions should hopefully help you answer the big question of the day: do you need to hire a divorce lawyer? These aren’t the only criteria. Every divorce plays out in a different way and what one case needs, another doesn’t. But this represents a good starting place and you should ask yourself these types of questions. In general, a divorce lawyer is there to help you, protect your rights, and look after your best interests, whatever they may be. It may look expensive now, but it often pays off big in the long run. If nothing else, it’s gives you the confidence of knowing you achieved the best outcome you could. Related Reading: Should You File for Divorce First? We’ve highlighted some of our favorite posts and your most common questions for our spotlight series. What are Grounds for Divorce in Oregon? Can Your Ex Stop Your Kids From Playing Sports? Advice for everyday dads looking for ideas to naviagting holidays, vacations, or just things to do in the Portland area.